I Have DACA. What Are My Immigration Options When DACA Ends? The President recently announced that the DACA (Deferred Action for Childhood Arrivals or “Dreamers”) program is ending as we know it. The government will not accept any new applications for DACA effective September 5, 2017. If you had a new DACA application pending already, the government will not automatically deny it, they will give you a decision. If you currently have DACA and your Work Permit is set to expire before March 5, 2018, you can apply to renew your DACA and work permit, BUT YOU MUST FILE BEFORE OCTOBER 5, 2017 or your application will be rejected. It is very, very important for everyone with DACA to look at their work permit immediately. If the expiration date is between September 5, 2017 and March 5, 2018, you should go see an experienced immigration attorney as soon as possible for advice on what to do. Do not wait, you must apply to renew your DACA and work permit before October 5, 2017 or you will lose both when the work permit expires. One important thing to remember about the President’s announcement is that everyone with DACA and a work permit will continue to enjoy the protection of not being deported and being able to work until the documents expire. That is, unless the government terminates your DACA before then for one of many reasons, like you were convicted of a crime or committed some sort of immigration fraud. So those with DACA and work permits currently will continue to enjoy the benefits until the documents expire. However, once the DACA documents expire, everyone who had DACA will be subject to detention and removal from the United States unless they find another immigration option. 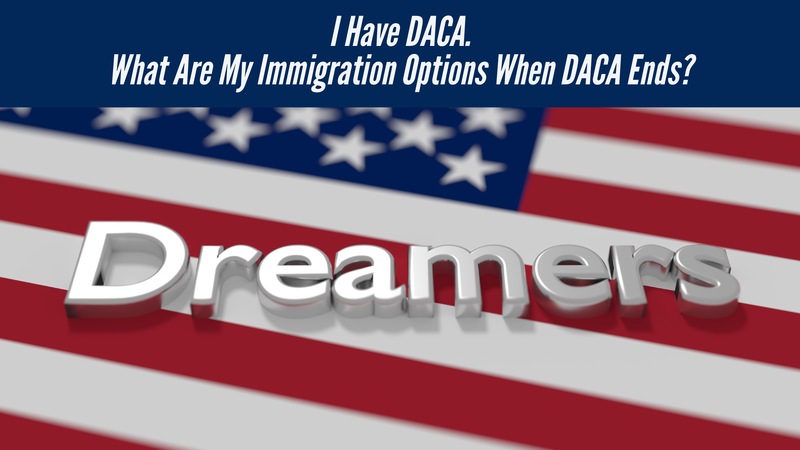 ​You were admitted or paroled into the United States before you received DACA? ​You may be eligible to apply to adjust your status in the United States without ​having to leave the country. Have been the victim of a crime in the United States and have suffered physically or emotionally because of it, and have you been cooperative with law enforcement regarding that crime? You may be eligible for a U Visa. Have you or your child been physically or emotionally abused by a U.S. citizen or LPR spouse or parent? You may be eligible to apply for immigration benefits under VAWA (Violence Against Women Act). If you have never been in immigration court and have a fear of going back to your country because of past persecution or a fear of future persecution, you may be eligible to apply for asylum and/or withholding of removal. Normally, you have to apply for asylum within one year of entering the U.S., but there are exceptions. Applying for asylum can also come with a new work permit when the DACA work permit expires. Asylum is complicated and if you do not do it correctly, or for the wrong reasons, you can end up getting deported and barred from all forms of immigration benefits and relief from removal. If you were or are in removal proceedings (immigration court), and your case was closed, you can go back to court and apply for any form of relief from removal for which you are eligible. This may include asylum, withholding of removal, cancellation of removal or others. There is still hope for Dreamers when DACA goes away, the worst thing you can do is nothing. Do not give up, do not flee the United States, do not go into hiding, call an experienced immigration attorney today to set up a consultation to discuss your immigration options! John is Board Certified by the Florida Bar in Immigration and Nationality Law and has been practicing law for over a decade. He focuses his practice on immigration and criminal defense. John has extensive experience as both an immigration attorney and a criminal attorney. John served as a Senior Attorney with the U.S. Department of Homeland Security, Immigration and Customs Enforcement (ICE). As an ICE Attorney, John handled all forms of removal/deportation proceedings including those involving aggravated felonies, drug trafficking, national security and human rights issues, and more. John also handled cases involving all forms of deportation/removal relief including asylum, withholding of removal, cancellation of removal for lawful permanent residents and for those who are not lawful permanent residents, adjustment of status, 212(c) relief, and many others. As an ICE attorney, John obtained Top Secret Clearance and assisted federal and local law enforcement officers assigned to the Joint Terrorism Task Force (JTTF). 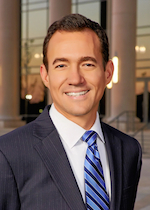 John has also served as a panelist and guest speaker at many Immigration and Criminal Law events throughout Florida and has provided multiple CLE-accredited trainings to attorneys. John has appeared on national and local television to talk about immigration issues and criminal cases. John has appeared live on the FoxNews Network national TV show Fox&Friends multiple times to discuss immigration, border security and national security issues.